1/2 cup grated Parmesan Cheese and about ¼ cup more for outside breading. Combine first 5 ingredients with your hands. Wet hands to prevent too much sticking and roll small meatballs and set aside. In a small bowl, place the remaining panko and ¼ cup parmesan cheese. Heat ½ of the oil in a large, oven-safe skillet. Roll each meatball in the breadcrumbs and then place in the heated oil. Repeat and turn meatballs to brown evenly. 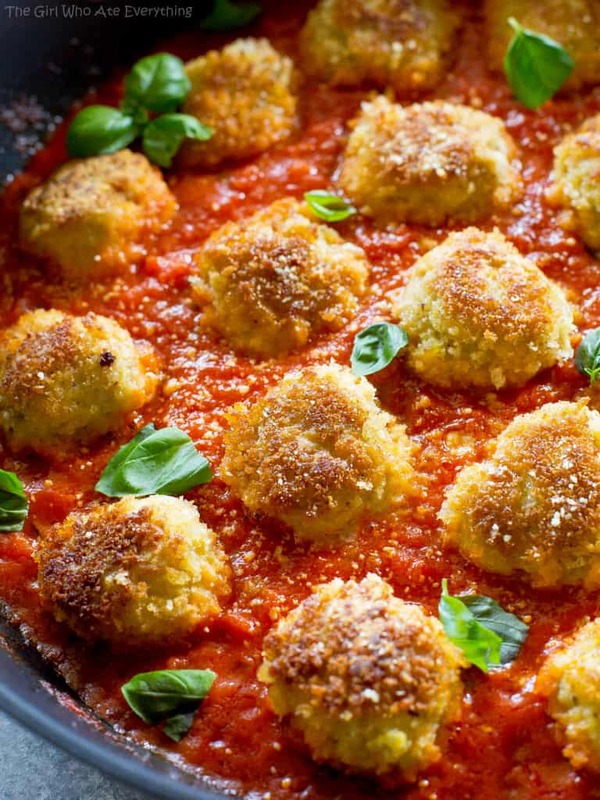 Remove the meatballs and pour marinara in the same pan. Place meatballs in the sauce and top with Mozzarella. Place in oven at 400 degrees for 15 minutes. Then garnish with basil. Serve over pasta or as a chicken parmesan sub!